I don’t think the bookies run a book on the results of the UK Coach Rally, but with eight wins in the preceding 15 years and consecutive victories for the past four years, I don’t think the odds you’d have got on Parrys International taking the UK Coach Rally Coach of the Year title for 2015 would have been very long. And so it was that Parrys latest Neoplan Starliner 2, surely among the most stunning and adventurous coach designs ever to have taken to the road, earned the Cheslyn Hay based firm their ninth title this millennium. I was part of the judging team and I looked in detail at every coach entered and must say that the 13.99m long 48 seater was a very worthy winner. As well as the Coach of the Year title, it also took the Neoplan Trophy and the Peter Rogers Trophy for the Top CPT member. 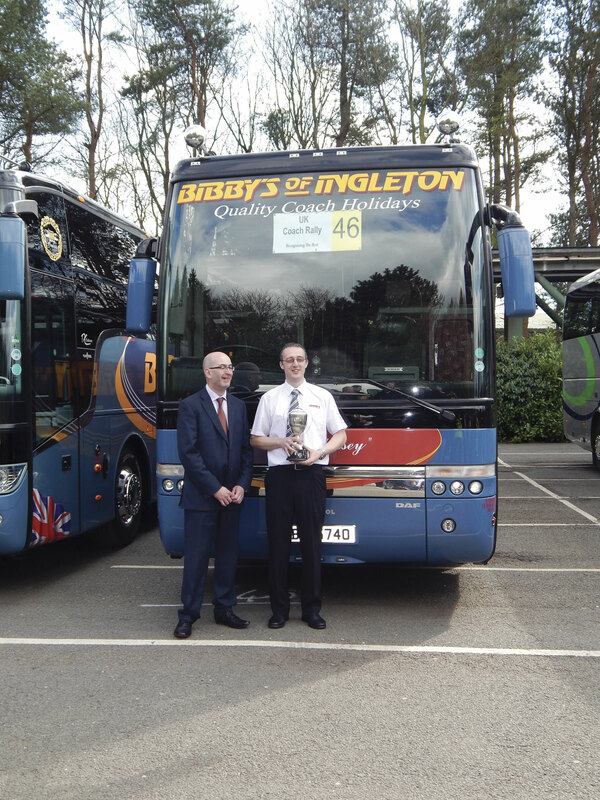 Even more hotly contested than the Coach of the Year title are the Coach Driver of the Year award, the Alan Goodwin Trophy for the Highest Placed Coach Operator in All Classes and the Top Team of the Year. After the Saturday driving tests, the 12 drivers through to the final drive off for full sized coaches on Sunday morning were: Steven Davies of Prospect Coaches; Stephen Mason of Jay & Kay Tours; Paul B Winson of Paul S Winson; Philip Stevens of Pulhams; Darren Stanford of Kenzies Coaches; Paul Marshall of Marshalls of Sutton-on-Trent; Marks Spoors of Stanley Travel; a delighted and somewhat surprised Murray Oliver (of Oliver Legal) driving for Stanley Travel; Richard Webb of Webbs Coaches; Matthew Haynes of Banstead Coaches; Anthony Head of Deckerbus; and Chris Bibby of Bibby’s of Ingleton. 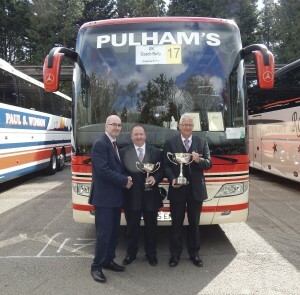 The three Midi coach driving finalists were: James Simmons of Prospect Coaches; Matthew Haines of Haines Minicoaches and Tom James of York Pullman. 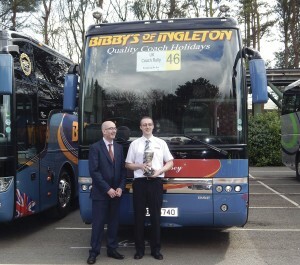 Gabi Scott of Stanley Travel, Ian Haines of Haines Minicoaches and Matthew James of York Pullman were the three finalists in the Minicoach Driver of the Year competition. 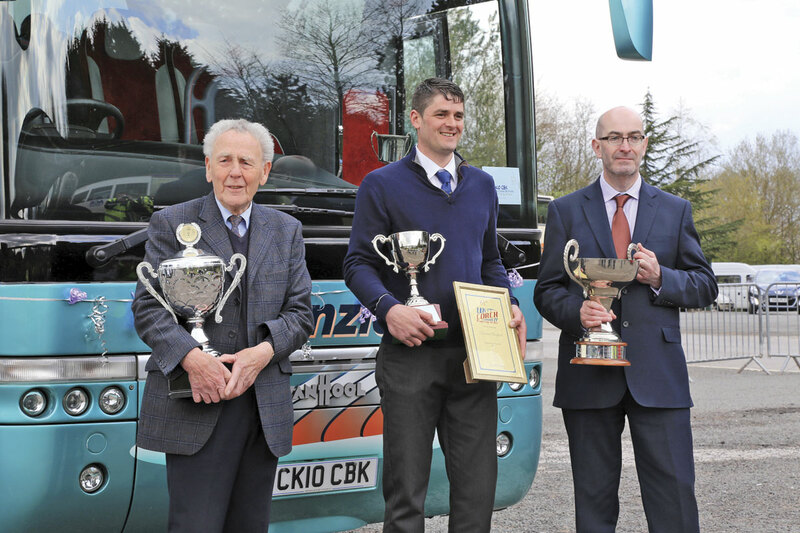 Winner of the UK Coach Rally Coach Driver of the Year title was Darren Stanford of Kenzies Coaches, the fourth driver from Kenzies to have taken the award, the first having been Cyril Kenzie himself who took it in 1957 and 1965. 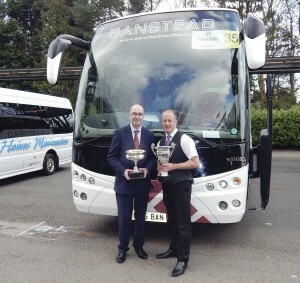 He was driving a 2010 Volvo B12B Van Hool Alizee T9 and together they also took the Alan Goodwin Trophy for the Highest Placed Coach Operator in All Classes, The Fred Bibby Award for the Best Loved Coach and the Moseley Trophy for the Top Van Hool supplied by Moseley. 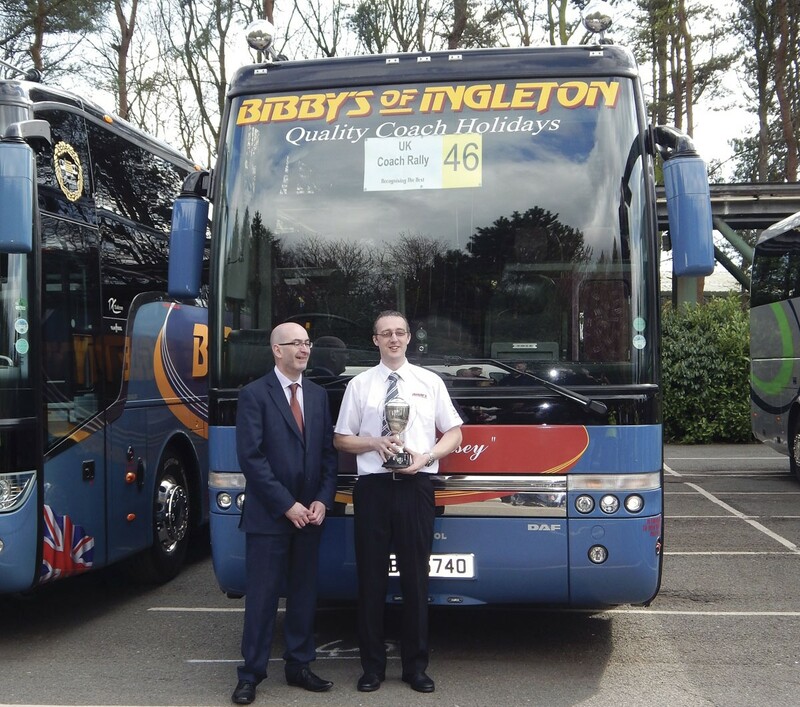 Runner up in the Coach Driver of the Year, taking the West Middlesex Coach Operators Association Trophy, as well as the Peter Bostock Trophy for the Highest Placed Driver in the Saturday Tests, was Richard Webb of Webbs Coaches. He was driving a 1983 Mercedes-Benz O-303 integral coach restored in the colours of Wahl Coaches who purchased it new. This had been the subject of a long and recently completed restoration with work done by the Volvo Truck & Bus Centre in Loughborough, Eastgate Trimmers, Edge Signs and EvoBus UK. The Top Team of the Year was Haines Minicoaches of Leatherhead whose Noone Turas 800 bodied Vario was driven by Matthew Haines who also won the Midi Driver of the Year title. Ian Haines from the same company won the Maurice Wrightson Memorial Shield , sponsored by the drivers of Stanley Travel, for the oldest employed participant in the rally. York Pullman was the Mini Driver of the Year driving a 2006 Sprinter 416CDi Onyx conversion. 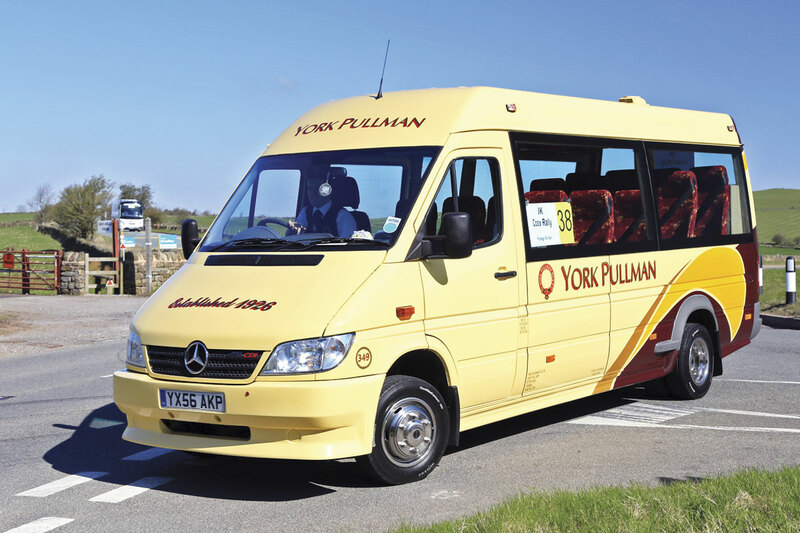 The Mini Driver of the Year was another Matthew, Matthew James of York Pullman who drove a 2006 Sprinter 416CDi Onyx conversion. 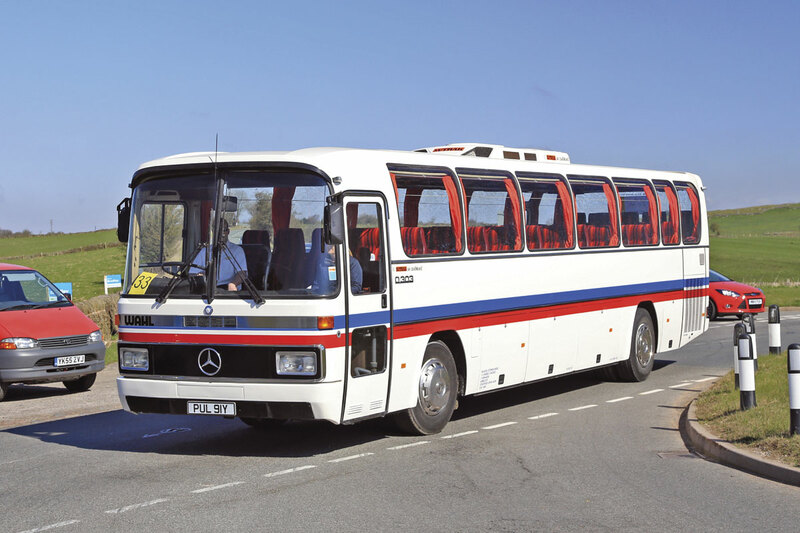 For the same company, a new Cheetah XL bodied Mercedes-Benz Atego 1218L won the Top Mini/Midi in the Concours D’Elegance, and the team was judged the Smartest Uniformed Driver & Courier. Always popular, the Director’s Challenge was won by David Eyre of Robin Hood of Leek who entered a VDL Futura FHD2. 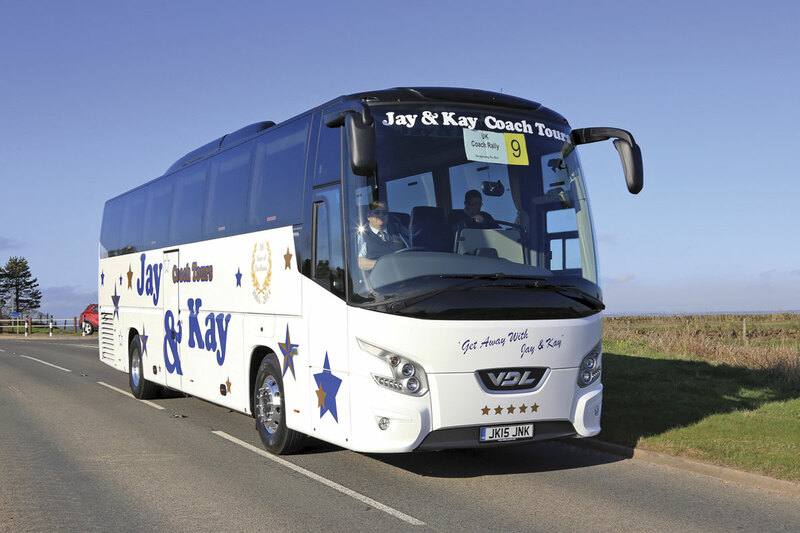 The model was much in evidence with Jay & Kay Coach Tours taking the Bova Trophy for the Best Bova/VDL Futura supplied by Moseley as well as the John Fielder Memorial Trophy for the best coach from a small fleet (of up to five coaches). 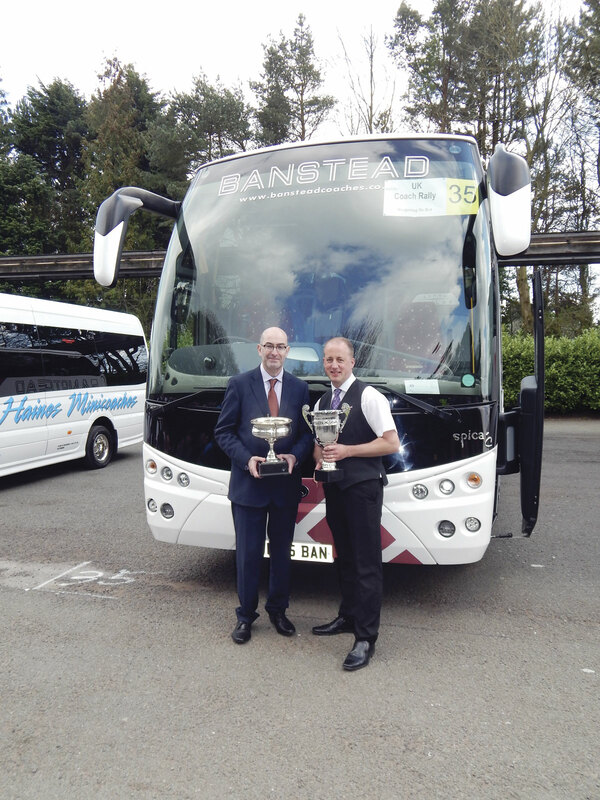 Prentice Westwood were the winners of the Tony Roose Trophy for the Best Coach from Scotland. Two other smart examples that failed to win prizes were those of Stanley Travel and Marshalls of Sutton on Trent. 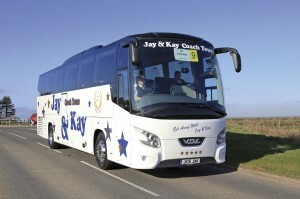 Also from the VDL stable was the Galleon Travel VDL Synergy double decker which won the VDL Berkhof Trophy. 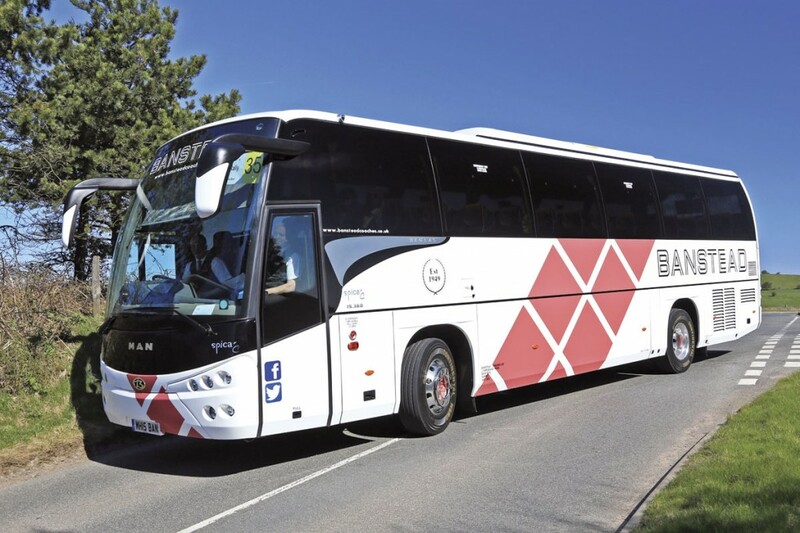 Another success for Galleon came with a 57-seat, 13.9m Irizar i6 integral with a DAF MX13.340 462bhp Euro6 engine and ZF AS-Tronic 12-speed automated gearbox that came complete with driver’s bunk, double USB sockets to each seating row, onboard vacuum cleaner and black tint privacy side windows. The graduated metallic paintwork with chrome effect London design livery, designed at Irizar Spain, was awarded the Boon’s Award for the best coordinated decor as well as the Irizar Trophy for the best Irizar integral. Another Irizar bodied coach to acquire silverware was Blakes of Tiverton’s 53-seat i6 bodied Scania K440EB6x2 which won the Scania Trophy. Banstead Coaches have been long term rally supporters though it was disappointing not to see Dudley Haynes in attendance. In his absence, Matthew Haynes had his three daughters to keep him in check. He was delighted to win the Top Standard Coach title with his 53-seat MAN RR8 19-360 with Beulas Spica C body as well as the Beulas Trophy. 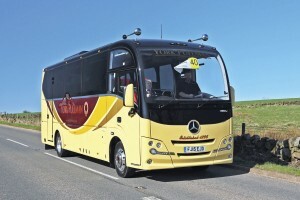 The Top Touring Coach was Pulhams’ Mercedes-Benz Tourismo M which also took the Mercedes-Benz trophy, beating off stiff competition from Epsom Coaches and Edwards Coaches of Pontypridd with similar vehicles. Edwards won the Cymru Trophy for the Top Coach from Wales. 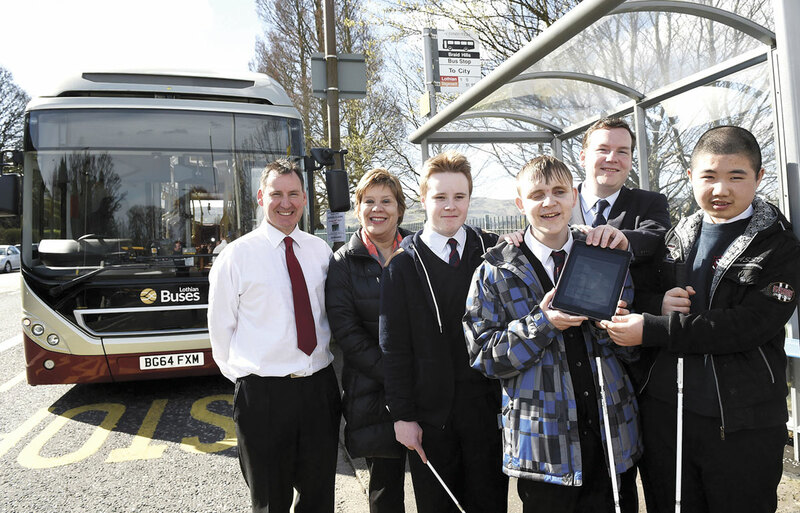 Prospect Coaches entered two new Plaxton coaches and one of them, a 41-seat Volvo B9R Panther Cub, won both the Plaxton Trophy and the Kirkby Trophy for the top Plaxton supplied by Kirkby Coach Sales. I’m not sure whether it was the biggest rigid coach ever entered in the Rally but the 15m Van Hool TDX29 Astromega Stagecoach looked a bit challenging to get round the driving course. It won the Van Hool trophy for the Best Van Hool. The crew didn’t have to fork out for a hotel room at Alton Towers, they slept on board. 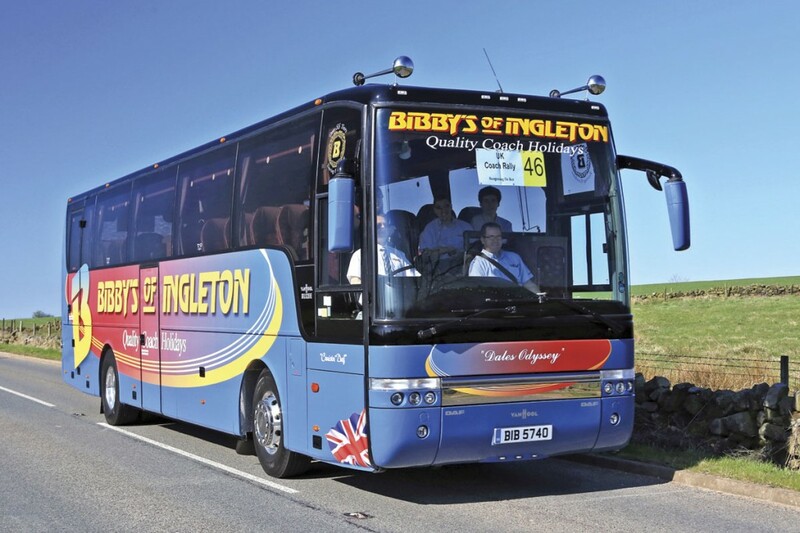 It is always good to see well looked after working coaches and Bibbys of Ingleton’s DAF SB4000 Van Hool T9 Alizee won the Top Coach aged Five Years or Older. It was actually 11 years old but the whole coach looked no more than a couple of years old. 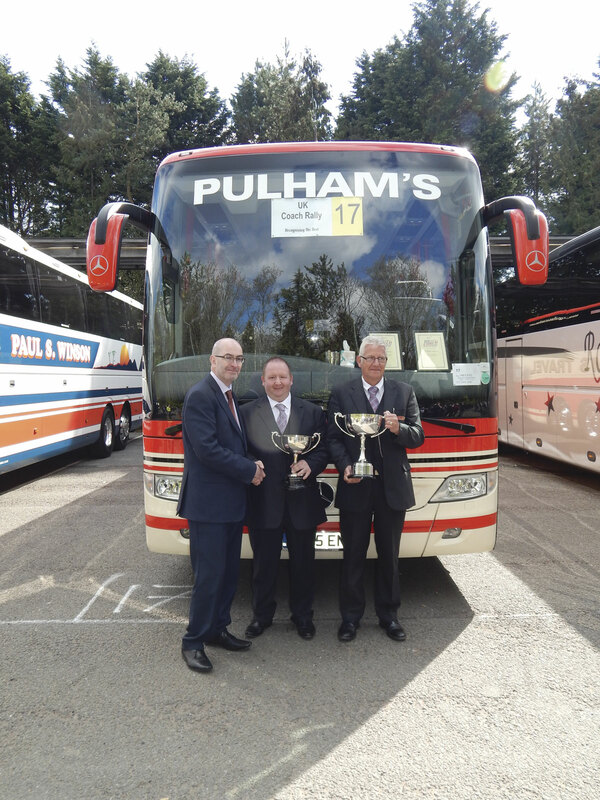 Coopers Tours of Killamarsh entered two vehicles and the LTCOA Martin Cornell Trophy for the highest placed London Tourist Coach Operator’s member in all classes went to their Van Hool T916. Before you write in, I checked and they are members. Remarkably, considering the dominance of the event they once enjoyed, there were no Setras to award the Kassbohrer Trophy to and also surprising, given the way they are selling at the moment, was the lack of a Jonckheere product to take the VDL Jonckheere trophy. Not everything can win prizes and among those that it was nice to see all the same was a super executive Van Hool based on a Van Hool T815 Acron. Called the Pullman Diner, it is now with DeckerBus but was new to Wharfedale and had a sumptuous restaurant interior reminiscent of a Gentleman’s Club (not that I’ve ever been to one). Tony Head has been restoring it to its former glories. Presenting the awards was Kevin Rooney, Traffic Commissioner for the North East of England, who had earlier played a full part in the judging process. He deserves some kind of a medal for turning up at all after last year’s drenching: it was so intense that he had to throw away the suit he wore for the day. This year the weather was altogether better and very welcome the sunshine was. There were a number of new additions to the trade section of this year’s coach rally, which was situated just behind the driving test arena. This was Ken Grindrod from Pelican Bus & Coach’s first rally and he brought along his wife of 40 years as well as the Yutong TC12 demonstrator and Cooper’s Tours’ Slovenian built TAM Vive TH 10.2m coach, which was first seen at Euro Bus Expo. Powered by a MAN D0836 LOH 72 Euro6 engine with ZF automatic gearbox, the 38 seat TAM also included air conditioning and toilet. The 12.28m Yutong TC12 is fitted with a 400bhp DAF PACCAR MX-11Euro6 engine and six-speed ZF EcoLife, fully automatic gearbox. The 51 seats are Yutong’s own and features include air suspension, fresh water sunken toilet, window curtains, removable headrests, charging sockets, and air conditioning. Stuart Jones covered this vehicle in a recent article (B&CB, issue 1314, 13 February 2015). EVM were the only minicoach offering this year. They had two Mercedes-Benz Sprinter conversions available to view: The Mercedes Benz Sprinter 519 Cdi X-Clusive 16 Seater minicoach was for Millionaire Executive of London. The model featured a host of extra’s including 7G-Tronic gearbox, Xenon headlights, fridge, genuine leather seating, Free-View TV, DVD Player, a multimedia entertainment system, panoramic double glazing and conference seating. Accompanying it, the Mercedes-Benz 516 Cdi Elegance 22 seater minicoach features 7G-Tronic gearbox, Audio 15 upgrade with satellite navigation and reversing camera built in, 22 Comfort seats in automotive trim and a removable partition for down seating. BASE had two vehicles from the Portuguese built MOBIpeople range to show visitors, as well as entering an Alexander ALX400 bodied DAF DB250 80 seater refurbished and upseated in their own workshops. The 9.1m MOBIpeople Midi Explorer shown in the colours of Excetera Coaches was built on a MAN TGL chassis with 180bhp engine and ZF automatic gearbox. 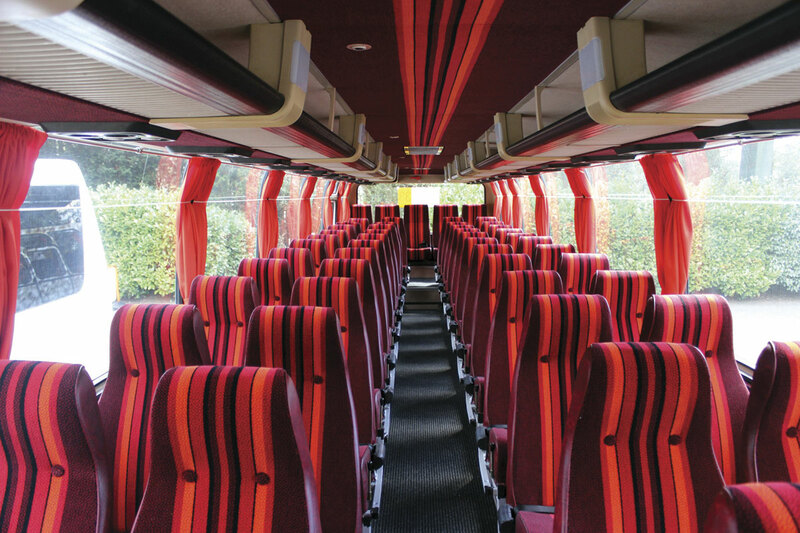 The 32-seat version comes with an extra large boot, air conditioning, double glazing and Vogel Primus seating which are fitted with three point belts. Accompanying it was a 12.49m MAN RR8 MOBIpeople Explorer 330-70 for KB Coaches of Stonehouse in Gloucestershire. 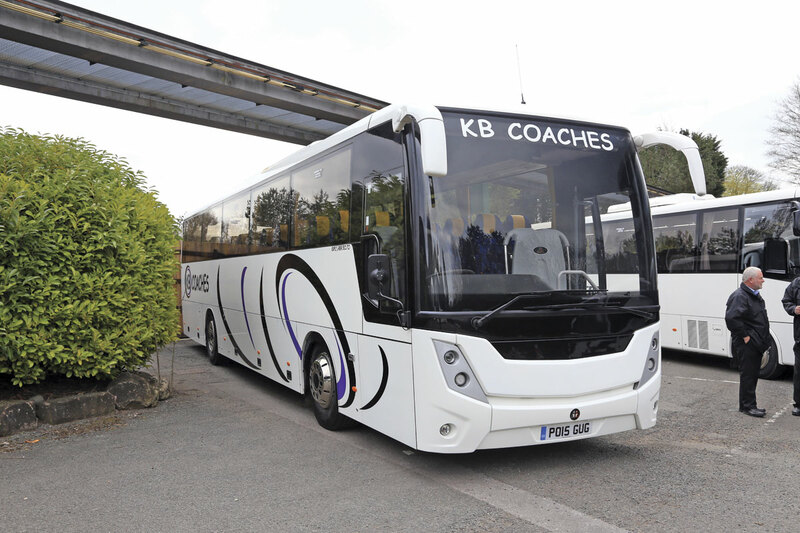 This air conditioned 70-seater had a 290hp engine and a ZF EcoLife transmission and had had a hoover and DVD system retrofitted by KB. The specification included Prime Buckingham seats and dual nearside doors. For more details on both models please refer to B&CB, issue 1304, 28 November 2014. 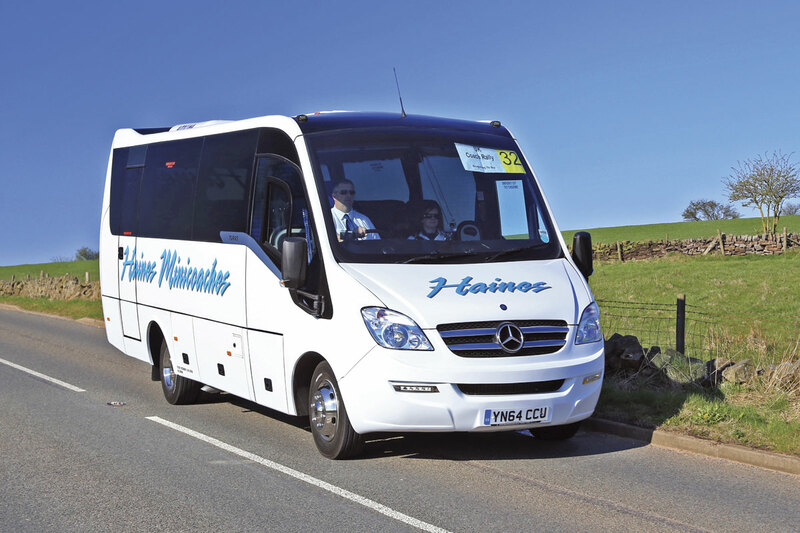 BASE will be bringing in the Italian built Barbi coach range on MAN chassis with the first examples scheduled to arrive in the coming weeks. BASE confirmed the current batch of MAN chassis’s at Barbi are now all sold with the first 61-seat, wheelchair accessible13.8m unit expected back in the UK in next four weeks. This is on an MAN RR4 480 chassis and will be followed by a 10.35m MAN RR2 360 with 43 seats sold to R Jamieson of Shetland and then a 12.49m 53-seat coach with five wheelchair spaces on an MAN RR2 360 chassis that will be shown at the NEC. Volvo’s presence was in the form of a 10.3m B8R chassis with Volvo D8K350 six-cylinder Euro6 engine and Sunsundegui SC5 coachwork. The leather headrest covered, reclinable seats come with footrests and cup holders. Features include double tinted, curtained windows; air conditioning; touch screen Sony multimedia system; reversing camera and monitor; two pneumatic doors, fridge; individual LED lights and six cubic metres of luggage capacity. The Moseley Group were represented by Alan White from Moseley in the South with a VDL Futura FHD2 129.370MX belonging to Rover European Travel of Nailsworth, Gloucestershire. 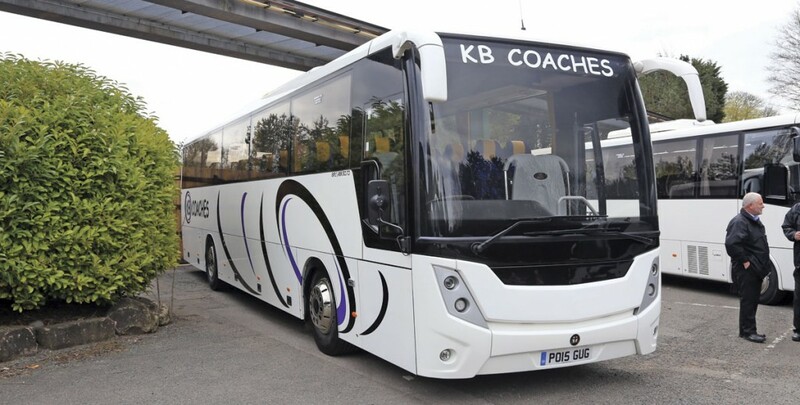 This 12.9m coach is fitted with a DAF PACCAR MX-11 Euro6 engine and ZF EcoLife automatic transmission with ZF Intarder3. Features include, air conditioning, double glazing, 55 Vogel Conturo reclining seats with footrests, centre continental exit with powered door, sunken toilet, fridge and reversing camera. The MAN Truck & Bus UK offering was the 13.26m P20 Neoplan Tourliner with a MAN D2066 482bhp Euro6 engine and ZF AS-Tronic gearbox. 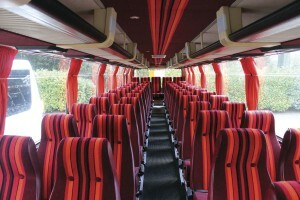 The 53 seats come with half leather as standard. Also standard is the drinks machine. 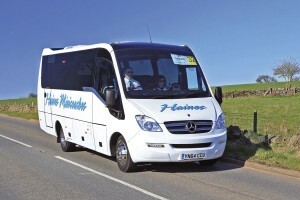 The model shown carried Neoplan Euro6 branding and was fitted with a toilet, sat nav, Bluetooth and a reversing camera. The company supplied Parrys International with the Neoplan Starliner that won the Coach of the Year title, one of the last examples of the model to leave the Plauen plant before it ceases coach manufacture later this month. A new option that will be offered in right hand drive Tourliners is the chance to install 2+1 luxury seating. 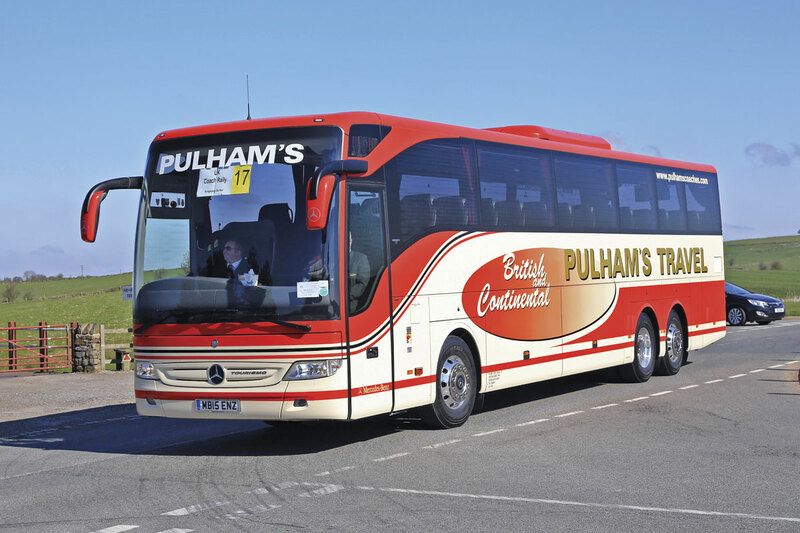 Irizar’s i6 integral was the focus of the trade exhibit from Irizar UK, with newcomer to the event, Galleon Travel of Essex competing in the driver championships in theirs. The 12.9m model on show will be registered as a demonstrator and has a DAF PACCAR MX-11 271, 369bhp Euro6 engine, with six-speed ZF EcoLife fully automatic gearbox. Features include 57 i6 seats with faux leather headrests and piping, a fixed centre sunken fresh water toilet, Bosch/Actia audio visual equipment including two flat screen monitors, a reversing camera and daylight running lights. Overall, trade support was greatly down on previous years and judging by the time that some of those that did attend left on Sunday something needs to be done to make attendance more worthwhile for this vital element of the rally mix. I had intended to come back for another look after doing my judging stint on Sunday but many of the exhibits had already departed, although that may be more of a reflection on the speed at which I completed the task. The UK Coach Rally has been held at Alton Towers for the past three years and though initially the location attracted a relatively good turnout, dissatisfaction with the site has grown among many operators and exhibitors alike for a variety of reasons including inaccessibility, cramped space and the lack of other things for those attending with the competitors to do. A meeting was held during the Sunday morning at which some of the shortcomings were discussed though I was not able to participate because I was judging at the time. I understand that next year’s rally will definitely not be at Alton Towers. A return to a seaside venue is favoured and several including Blackpool and Bournemouth have been mentioned, though no decision has yet been taken on where it will be. There won’t be any more new Starliners for Parrys International to enter next year either, though I’m sure Dave will come up with something equally stunning, but it might encourage more operators to challenge him for the top award, so the likelihood is that next year’s rally report will be telling a very different story. Hopefully it will be one of rebirth. I’m looking forward to it.